Set a table with romantic candlelight with one of our votive candle holders, available in country, primitive, contemporary, and farmhouse styles, by Colonial Tin Works, The Hearthside Collection, Abbott, Market Street, and more! Set of two glass votive candle holders with a beautiful mercury glass antiqued finish. 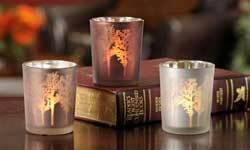 Forest Silvered Glass Votive, by Giftcraft. Silvered on the inside, colored frosted glass on the outside, with silhouette of trees. Sold individually - Choose the Left, Middle, or Right Votive. Measures 2.1 x 2.5 inches. Will fit a tealight or votive candle (not included). Made of glass. Handmade, features the fox image. Painted glass pieces illuminate in candlelight. Part of the Foxy Fall Collection. 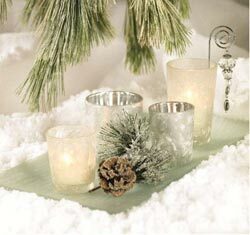 Set your table with a simple, versatile pressed glass taper candle holder, with simple elegant shape and swirled texture. 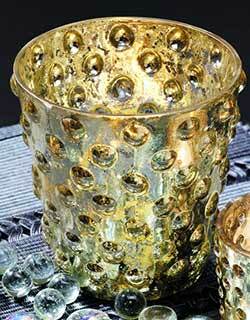 Light up any room with this glass votive candle holder cup, featuring a hobnail texture, with gold and silver antiqued finish. This versatile hammered glass cylinder comes with a metal candle pan for displaying your votive or tealight candle, while small decorative items can be placed underneath. 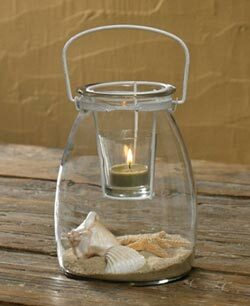 White Jar with Votive Holder, by Park Designs. 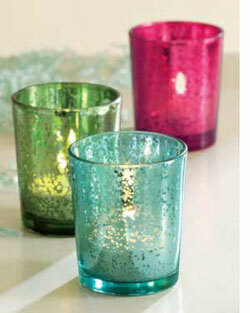 This glass votive set has infinate decorative possibilities! Fill the jar with glass and shells for a beach theme, dried rosehips for a primitive country accent, eggs for spring, conversation heart candies for Valentine's Day, the list goes on and on! 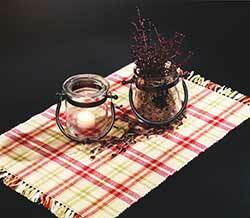 A metal holder with glass votive cup fits on the top, and it has a metal handle so you can hang as a lantern! This is for the WHITE version. Measures 7 x 5.5 inches. Black also available! (candle and decorative accessories shown in photo aren't included, they're just meant to inspire :) ). Set of four blown glass candle votive holders in four assorted colors, featuring shades of blue, red, yellow, and green against clear glass. 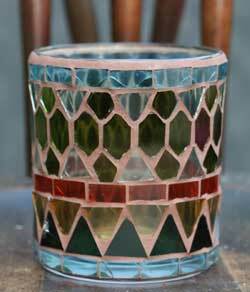 Plymouth Mosaic Glass Votive, by Tag. 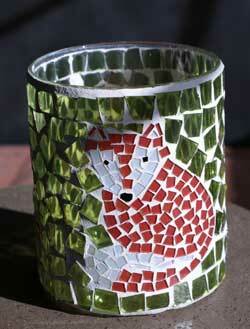 Beautiful, handmade glass mosaic votive candle holder in in a pattern of rich autumn colors. Measures 4 x 3.75 inches. Part of Tag's give Thanks Collection. Photo courtesy of Tag. Spring Luster Votive, by TAG. 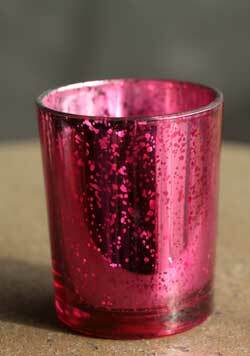 Lovely colored mercury glass votive candle cup. This is for the AQUA BLUE votive cup. Measure 2.625 x 2.25 inches. Spring Luster Votive, by TAG. 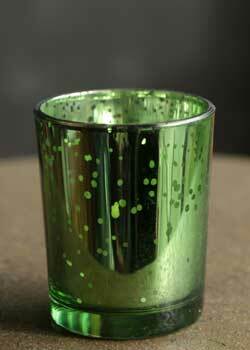 Lovely colored mercury glass votive candle cup. This is for the GREEN votive. Designed to hold a standard sized votive candle or tealight. Measure 2.625 x 2.25 inches. 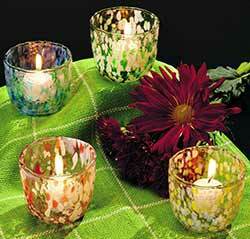 Spring Luster Votive, by TAG. 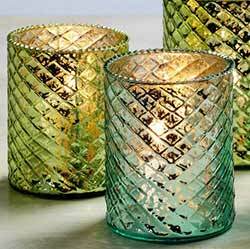 Lovely colored mercury glass votive candle cup. This is for the PINK votive. 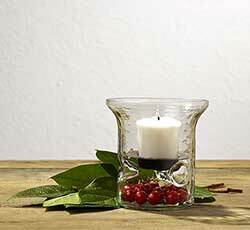 Designed to hold a standard sized votive candle or tealight. Measure 2.625 x 2.25 inches.